South Africa’s current flag was introduced in 1994. In it’s short life, it has become arguably one of the most well known African flags. As we will explore, however, this design was only meant to be a placeholder. Flag of the Union of South Africa (1912-1928). South Africa’s first flag was flown in 1910 when the British united the Natal, Cape, Transvaal, and Orange River colonies after the Boer Wars, forming the Union of South Africa. The flag was a simple red union ensign (typical of British colonies) with a shield containing symbols of the four original colonies. In 1912, the flag was slightly changed by placing the shield on a white circle. Flag of South Africa (1928-1994). Many of those native to the original colonies, particularly those in the Orange River colony, took offense to this flag as it represented British Imperialism. By the 1920s, talks to redesign the flag to include native South African symbolism slowly began to materialize. In 1928, the South African Parliament approved the design you see on the left. The design is based off of the royal Dutch House of Orange flag, as it is believed that Jan van Riebeeck, a Dutch explorer and founder of Cape Town, raised it when he first landed in South Africa. In the middle of the white stripe are three small flags. The flag of the former Orange Free State (which became the Orange River colony) is in the middle, the flag of the former Zuid-Afrikaansche Republiek (which became the Transvaal colony) is on the right, and the Union Flag is flying left. The Union Flag may look “backwards” because the hoist is on the right. South Africa continued to use the design when it became a republic in 1961. Despite the flag’s original intent of inclusion, it became associated with the ruling National Party and their apartheid system of racial segregation. 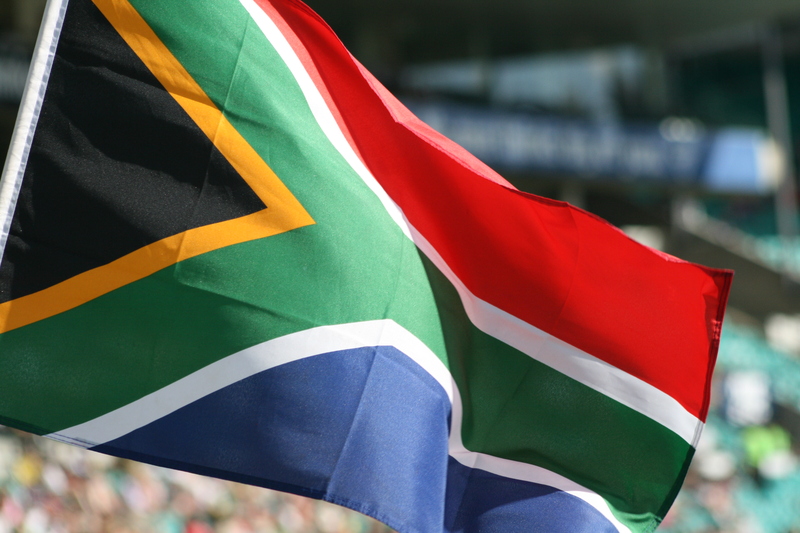 When negotiations began to end apartheid in 1990, replacing the flag was made a priority. South Africa held a contest to create a new flag in 1993. Thousands of designs were submitted and six were chosen as contenders. None of the contenders garnered much support and 1993 went without the adoption of a new national flag. With the first national election of the post-apartheid era coming up in two months, the African National Congress pressured South Africa to adopt a new design in February of 1994. State Herald Frederick Brownell, who had designed Namibia’s flag in 1990, came up with what was meant to be a temporary design on March 15, 1994. The design wasn’t officially approved by then President F. W. de Klerk until April 20, 1994, a mere week before the elections. While the short timespan proved difficult for flag manufacturers, they were able to get the temporary flag ready for election day and the inauguration of the new South African President Nelson Mandela just a few weeks after. The temporary conditions of this flag design stated that a vote would be held five years after its induction to decide whether to keep it or not. Although initial opinions of the flag were mixed, it eventually gained overwhelming support and was made the official flag of South Africa. Current flag of South Africa. The design is the only national flag to have six colors in the main theme (not counting elements like seals, etc.). It features blue, white and a red/orange (officially chili red), representative of its Dutch and British heritage, and the African National Congress (ANC) colors of black, yellow, and green. The “Y” shape of the ANC colors is meant to represent their role in unifying the country as a new democracy.